This BLOG On Getting a Mortgage After Bankruptcy Was Written By Michael Gracz of Gustan Cho Associates at Loan Cabin Inc.
Getting a mortgage after bankruptcy can be hard, but it is not impossible. You can still get a mortgage as guidelines have been established by many lenders for underwriting mortgages for borrowers who have experienced bankruptcy, completed a minimum waiting period and met specific eligibility requirements. In this guide, I’ll provide information about how a borrower’s ability to get a home loan is affected by bankruptcy and how you—a borrower—can acquire a loan if you have filed for bankruptcy. The bankruptcy stays on the credit report for 7 to 10 years. How much the credit score of a borrower is affected by it depends on their credit profile. For example, if the credit score of a person is good before bankruptcy, it will drop significantly. Someone who has a credit score of about 700 or more might experience a drop of 100 points. Someone whose credit score is already poor may not experience a major drop. Although the mark of bankruptcy stays on the credit report of a borrower for 10 years, its impacts reduce over time. When a Chapter 7 Bankruptcy is filed by a person, they must liquidate many of their assets and then pay their creditors. Chapter 7 Bankruptcy allows a person to start fresh as he/she is discharged from all debts. People who cannot repay their debts usually file for the Chapter 7 Bankruptcy. A borrower can get a home loan after Chapter 7 Bankruptcy. The factors that will impact the loan process include the amount of down payment that a borrower can afford and the time it has been since the borrower was discharged from bankruptcy. For instance, if someone can afford to put down a larger down payment — say 20% of home’s purchase price — they can easily apply for a home loan the day after getting discharged from their bankruptcy. However, they will be charged higher interest rates. If they wait for a year after discharge from their bankruptcy, they can get a home loan with 20 percent down payment and perhaps some discount points, also a higher interest rate, but not as bad of an interest rate a day after discharge. People who have a steady income and wish to pay all their debts, but aren’t able to do so because of financial difficulties usually apply for Chapter 13 Bankruptcy. This type of bankruptcy enables the debtor to keep their valuable assets such as their property or car. In the filing of Chapter 13 Bankruptcy, a plan is proposed by the debtor to repay creditors. Normally, the repayment plan’s timeline is three to five years. If the plan is approved by the court, payments are made through a bank approved trustee. While the plan is in the process, the creditor can’t file lawsuits or take other actions against the debtor. Once the plan is completed, the debtor is discharged off of all remaining debts. 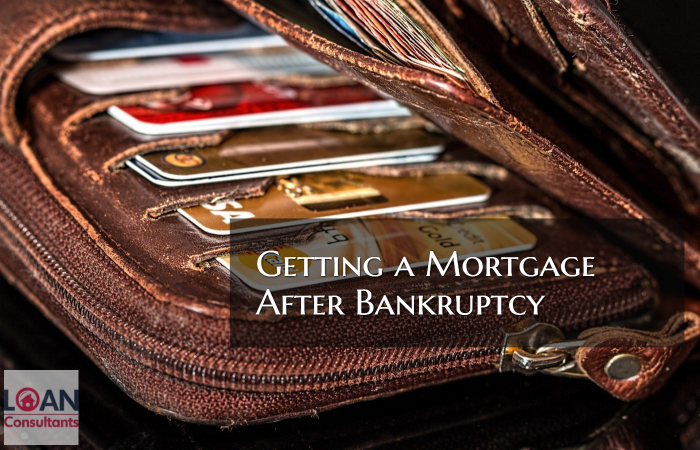 For a conventional mortgage, a borrower must wait for 4 years after discharge from Chapter 7 Bankruptcy. For both FHA loan and VA loans, a borrower must wait for 2 years after discharge from bankruptcy. For a USDA loan, a borrower must wait for 3 years after discharge from bankruptcy. For a conventional mortgage, borrowers must wait for 2 years after discharge date or for 4 years from the date of dismissal. For an FHA loan, VA loan and USDA loan, the borrower must wait for 1 year while in a chapter 13 BK and can apply immediately after getting discharged from Chapter 13 Bankruptcy. A foreclosure on the credit report can increase the waiting period. For conventional loans, the waiting period in an event of foreclosure is seven years. Freddie Mac and Fannie Mae, however, have unique prepositions that are applicable when the debt on the foreclosed property’s mortgage was discharged through bankruptcy. If that is the case, the waiting period for the borrowers is reduced to two years. For FHA loans and USDA loans, the waiting period is of three years after a foreclosure. For a VA loan, the waiting period is of two years. The conventional mortgage adheres to Freddie Mac’s and Fannie Mae’s guidelines. Conventional loans can have an adjustable or fixed rate and their term ranges from ten to thirty years. Generally, the minimum credit score required for a conventional mortgage is 620 with a down payment of 3 percent. If a borrower wants to get approved for this type of mortgage, they must wait for the minimum waiting period as described in the earlier section and demonstrate to the lender that they have re-established their credit. In order to re-establish credit, the borrower must pay all the payments on time and keep balances an all credit accounts low. The Federal Housing Administration (FHA) insures this type of mortgage. The lending requirements of FHA loans are much more flexible than a conventional mortgage. FHA loans are offered in 15-year or 30-year terms and rates are adjustable or flexible. Borrowers can qualify for an FHA home loan with a minimum credit score of 580 and a down payment of 3.5 percent. However, if the credit score of the borrower is below 580, they must put in a down payment of 10 percent to qualify for an FHA loan. In addition, the FHA also requires borrowers who filed for bankruptcies to establish a good credit. The loan applicants are also required to explain the circumstances that caused bankruptcy. I’ll use an example of a borrower whose credit score was 680 before filing for bankruptcy to demonstrate how bankruptcy affects a borrower. The borrower has reached the minimum waiting period of 2 years and has applied for a 250,000 loan with a 30-year payment term. The credit score of the borrower was 620 when he applied for the loan. Thus, the borrower must pay an additional $63,447 if he gets an FHA loan after bankruptcy. The U.S. Department of Veteran Affairs (VA) backs this type of mortgage for veterans. There is no minimum credit score requirement for a VA loan. Instead, the lenders review the complete profile of the applicant to make their decision. This is the requirements of the VA, however, lenders have established their own credit requirements which makes it hard for borrowers to qualify for a VA home loan. VA loans are available for veterans with zero down payment, they have 15-year or 30-year terms and adjustable or fixed rates. VA loans exist to help veterans get a mortgage for a home, that’s why they are much more lenient than other mortgages with respect to the credit history of a borrower. Borrowers who filed for bankruptcy are eligible for a VA loan just after one or two years of discharge. During the waiting period, the borrower should try to rebuild their credit. The U.S. Department of Agriculture (USDA) backs up USDA loans for borrowers who wish to purchase a home in certain rural areas. USDA loans are fixed-rate and have 15-years or 30-years terms. The minimum credit score required by mortgage lenders for a USDA mortgage is 620 with no bankruptcies or foreclosures in the last three years. However, if the bankruptcy occurred because of extenuating circumstances, the waiting period may be reduced to 1 year. The events that are considered an extenuating circumstance usually vary by a mortgage lender, but mostly include divorce, employment loss, natural disaster or illness or death of the family’s primary earner. In case the bankruptcy resulted because of extenuating circumstances, the borrower will be required to provide documentation that supports their claim. No matter how long a borrower needs to wait before they can qualify for a mortgage, they should use this time in their favor to re-establish good credit. This will improve the borrower’s chances of getting approved when the waiting period is over and also make them financially capable of handling the repayments on the mortgage. A borrower should pay all bills on time to rebuild a good credit. While mortgage, car loans, and credit cards are usually considered important for building a credit score, there are other payments too that can have an impact on the credit score. A borrower should be careful when applying for a credit as lenders check the credit report of the borrower and run an inquiry. Inquiries can negatively impact the credit score of a borrower. Moreover, a borrower should get a copy of their credit report from credit reporting agencies to analyze them for inaccurate information. If any discrepancy is found in the credit report, the borrower should report it to the credit reporting agency to ensure that their borrowing power isn’t negatively affected by incorrect reporting. As you can see, getting a mortgage after bankruptcy is possible and it’s not the end of the world. Just because you have filed for bankruptcy doesn’t mean that you won’t be able to get a mortgage to buy a new home. After the waiting period is over you can become eligible for conventional loans, FHA loans, VA loans and USDA loans, so don’t worry if you have filed bankruptcy.